Effective 1 October, listed Swedish property company Kungsleden forms a new business steering group to replace its previous group management. Regional Managers and the Development Manager will join the business steering group team. “This change is an important step in implementing Kungsleden’s new strategy. Our new management structure will create better prospects of managing the company with shorter decision making processes and greater flexibility, while bringing us even closer to our local real estate market, customers and operations,” commented Biljana Pehrsson, Chief Executive of Kungsleden. The new members of the business steering group are Frida Stannow Lind, Development Manager, Kjell Bergman, Interim Regional Manager Stockholm, Nina de Besche, Regional Manager for Mälaren Valley and North, Nicklas Arfvidsson, Regional Manager of Gothenburg and Gert Ternström, Regional Manager of Malmö. The other members of the business steering group are, as previously, Biljana Pehrsson, CEO, Anders Kvist, Deputy CEO and CFO, Ylva Sarby Westman, Transaction Manager, Eskil Lindnér, Head of Property Management and General Counsel Åke Theblin. 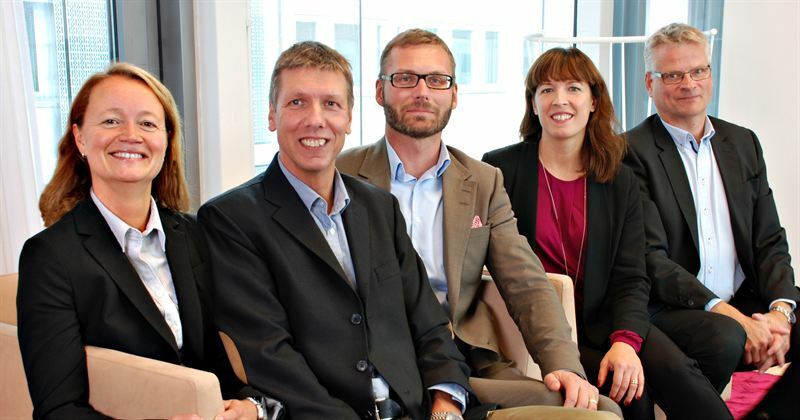 New members of the management team: Frida Stannow Lind, Gert Ternström, Nicklas Arfvidsson, Nina de Besche and Kjell Bergman. Kungsleden AB (publ) discloses the information in this press release according to the Swedish Securities Markets Act and/or the Swedish Financial Trading Act. The information was provided for public release on 29 September 2013 at 09:00 a.m.